Seriously, How DO You Give Up Cheese? I’ve touched on this subject before, but it’s such a common stumbling block for newbie vegans, it’s always worth coming back to. I honestly do get the cheese thing. And in a moment you’ll see I’m not just saying that to sound relatable. I lived in France in my teens and early twenties and probably ate some of the world’s best cheeses. Can I say that? I think I can. Approximately 65 – 75% of the world doesn’t eat dairy, it’s mostly a European thing (or seems to have its origins in Europe), so I think it’s fair to say France probably has what is generally considered to be the best cheese. I wasn’t a huge blue cheese fan, but I never met a soft cheese I didn’t like, Camembert and Brie were definite favourites, Emmental on fish soup tasted like heaven (OK, that’s Swiss), gouda and apple was a well-loved snack (OK that’s Dutch), and fromage blanc with sugar was a yummy simple dessert (that’s pretty damn French). And I ate SO MUCH of it. I always found it hard to stop eating cheese in terms of the amount I ate at one sitting. I will never understand those diets that say you can eat what you ate before, just smaller amounts. How DO you do that? If I ate some of the cheese, I wanted ALL of the cheese. Being an animal product, cheese has ZERO fibre, so it doesn’t fill you up. This is why it’s more difficult to stop eating cheese than it is to stop eating rice, say, or beans. And you wanna know why cheese is just so damn hard to give up? Because it’s smack, that’s why. Dairy contains casomorphins. These are opiate-like peptides designed to keep the calf interested in suckling its mother’s milk. All dairy contains a protein called casein. Because cheese is the most concentated form of casein, it contains an abundance of casomorphin and is thus more addictive than other dairy products. When you know this, it helps with the intellectual motivation to give cheese the old heave-ho; isn’t it weird that natural opiates that were meant for a baby cow are having their wicked way with YOU, an entirely different species? OK, you get this. But now let’s get practical. How do you actually get cheese out of your life without feeling deprived or having cravings? Now I’m not sure we can eliminate cravings entirely – casomorphin is a drug after all; but we can reduce them, and distract ourselves from them by eating a ton of delicious, flavourful, texture-rich food. They say it takes approximately twenty-one days to make or break a habit, so absolute worst case scenario; in three weeks, any cravings you’ve had should be gone. How do we stay sane for three whole weeks without cheese? 1. While transitioning away from cheese, if you have hellacious cravings, try cheese substitutes. Don’t worry; there are some great ones now. Want melted cheese, on toast, on pizza, on pasta or on a baked potato? 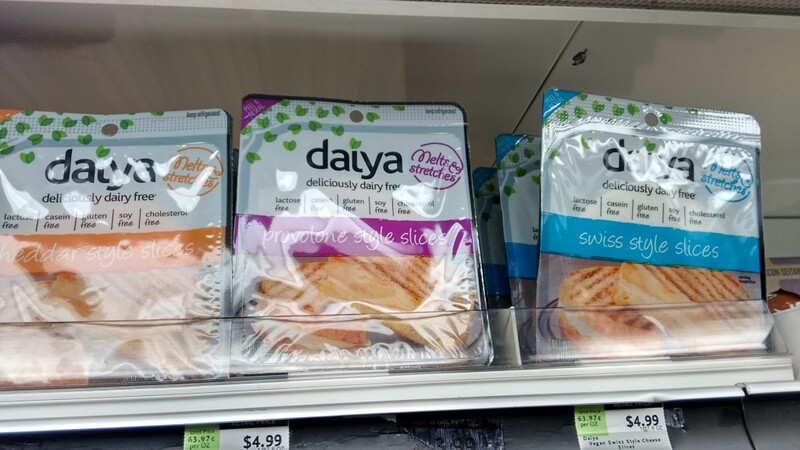 In the US, try Daiya or Follow Your Heart. Daiya comes shredded too – excellent for pizza topping or on toast. I’ve tried both of these many times and in my opinion, they are the best. Brits, you can order Daiya here. There are other vegan cheeses in the UK that have been around for a while (naming no names!) but they are pretty gross, and even grosser melted. I believe Violife is the best vegan cheese to date. 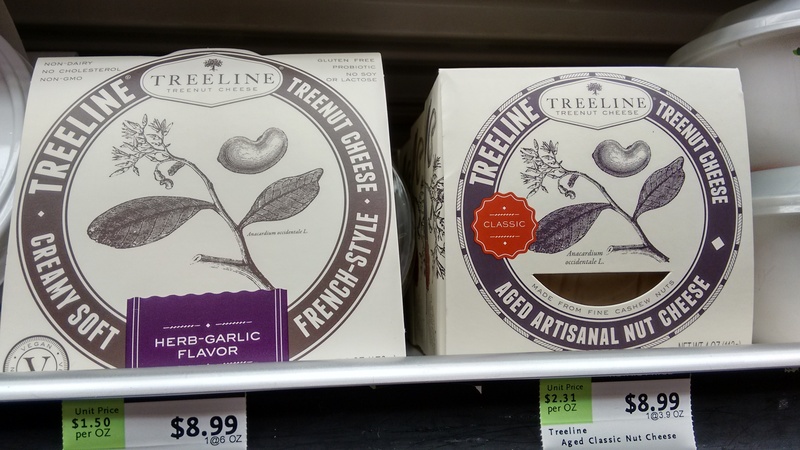 In the US, try Kite Hill or Treeline Treenut Cheese. 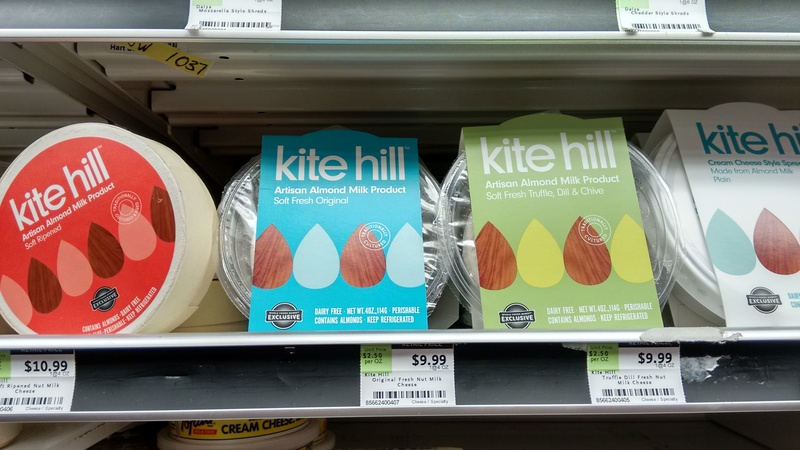 I tried the plain version of Kite Hill and it absolutely blew me away with how much like Camembert it tasted. They’ve basically put the same plant-based cultures that are in dairy soft cheeses – into almond milk. The effect is uncanny. I don’t think you could tell it wasn’t a dairy cheese if you didn’t know. In the UK, Tyne Chease is about to launch, which is the same thing but with cultured cashew milk instead of almond milk. This promises to be fabulous too. 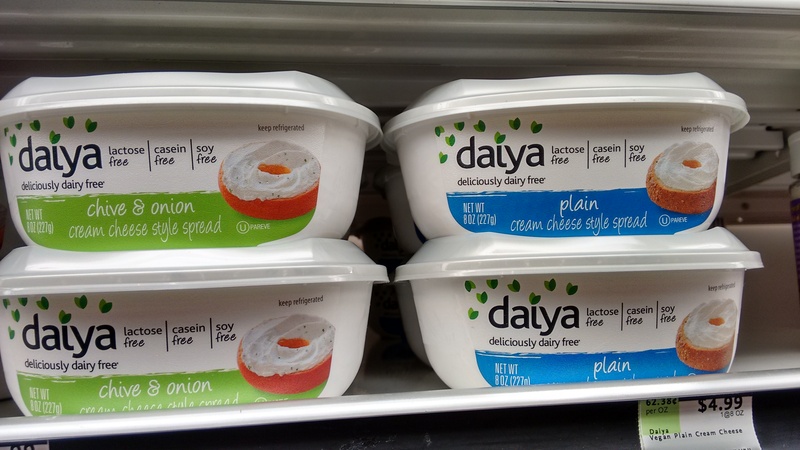 Daiya to the rescue AGAIN! I ‘ve not yet tried this, and there are lots of other options, so find what’s best for you. Violife do a spreadable cheese too, so I’d try here first in the UK and Europe. None of these cheeses are too unhealthy either. 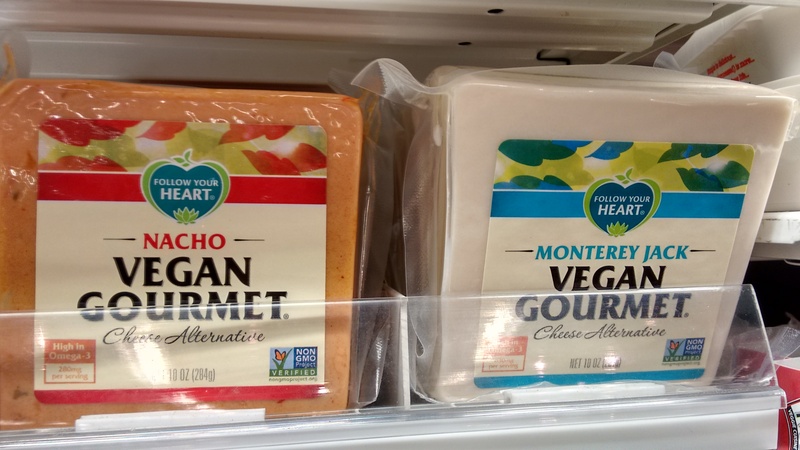 In the past vegan cheeses have been made with yucky trans-fats, but no more. The soft cheeses, being made from cultured nut-milk and nothing else, are definitely healthy. In any case, NO vegan cheese contains saturated fat, cholesterol, casein (the most relevant food-based carcinogen in existence) and hormones, like animal cheeses do; so health wise they’ll always be a better bet. 2. Replicate that cheesy taste and texture with other foods. 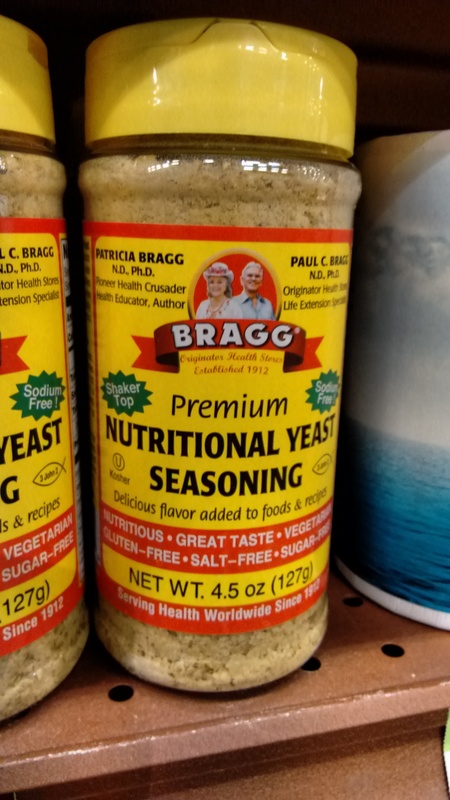 For many years, Nutritional Yeast has been best friend to many vegans, particularly in the US. Thanks to the internet, it’s now available everywhere. It’s ace at bestowing a cheesy flavour upon your favourite foods. Use it on pasta dishes, popcorn, in vegan ‘cheese’ sauces, on mashed potato etc. Anywhere you want essence of cheese, really. Don’t worry if you’re yeast-sensitive, it’s actually de-activated yeast so shouldn’t trigger any issues. It’s also a good source of vitamin B12! Tahini sauce can do a good job of tasting like a cheesy dressing. Mix light tahini with water to make a thin sauce; add lemon juice, soy sauce (or salt), and garlic powder. Pour it on salads, over jacket potato, or just dip into it with whole wheat bread or rice crackers etc. My recipe for it is here. The internet can surely provide others. The more you make it the more you’ll make it to your taste and you’ll find you develop your own version. 3. Explore, explore, explore. Try food from all around the world. Try eating food from cultures that just don’t eat cheese. Because we have cheese in our culture (or culture in our cheese 🙂 ), some dishes were created AROUND it, so to just take the cheese out of these dishes will often mean you’ll feel like you’re missing something. If you eat Japanese, Korean, Chinese, Indian, Ethiopian, in fact food from most African, Asian and Middle Eastern countries where cheese is just not a part of the daily diet, you’ll find the flavours and textures so rich, full and satiating, you won’t miss cheese at all. If you’re trying your hardest to go fully plant-based but just can’t let cheese go, then DON’T. 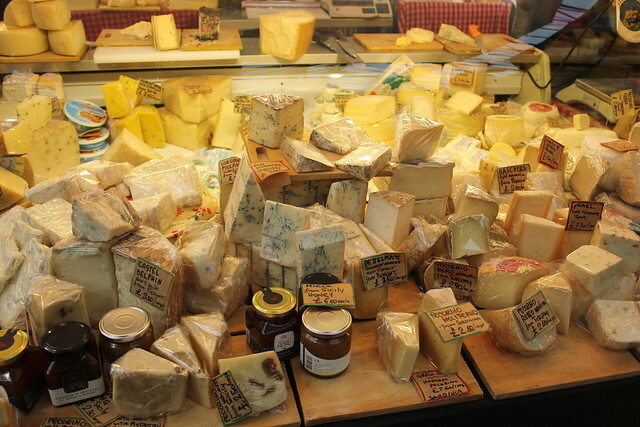 If cheese is your only weakness, then give up every other animal product apart from cheese – for now. As myself and many other vegan teachers say, don’t do nothing because you can’t do everything. I’m confident that as you progress and learn more about the ethical, environmental and wellness benefits of a plant-based diet, and as you start to feel better health-wise and clearer of mind, your body and intuition will gradually see that you turn away from it. Author Karen (Vegan Coach)Posted on June 1, 2015 June 10, 2015 Categories How to go veganTags casein, dairy, non-dairy cheese, vegan cheeseLeave a comment on Seriously, How DO You Give Up Cheese? How many times have you heard people bemoan the fact that they’d find it hard to give up this or that animal food (usually cheese!) and replace it with anything else, or that they don’t think they could start a new way of eating after eating meat, dairy and eggs for so long? Maybe you are the one thinking it. It’s never too late to change a habit. You’ve probably done it loads of times with lots of things already in your life and not even realised it. Remember when you gave up putting sugar in your coffee/tea? Remember how it tasted weird at first, but pretty soon after, you couldn’t imagine drinking it any other way? And remember how when you were a kid you ate a tonne of jelly (‘jello’ if you’re in the US), or (insert any kids sweet treat here), and now you no longer eat it cuz you’re not 7? Do you crave it? Of course not. Why? Because your taste buds got exposed to more sophisticated desserts. You moved on. The good news is, it’s the same for everything. You may well have been putting cow’s milk on your cereal for 20/30/40 years, and soy/rice/almond milk may well taste weird when you first use it. But after a couple weeks of a new regime, if you put cow’s milk on your cereal, it will taste gross and you’ll wonder how you ever ate it. Our senses are so amazingly versatile and impressionable, they’ll habituate to whatever we expose them to. Every food habit is just that, a habit. Any habit can be changed in just a short space of time (usually between 14-21 days). We can crowd out the cheese in our diets with lots of other tasty foods that would leave no room for it. If, in a transitional stage, you need the taste/texture of cheese, there are an abundance of tofu cream cheeses on the market. Nutritional yeast can replicate a cheesy flavour, or you could try one of the vegan cheeses available in your part of the world. In my opinion, Daiya and Follow your Heart are the best ever, but these are only available in the US and Canada. Violife is the better option in the UK (this is only my opinion – try them all and see which one suits you). Bottom line – it’s always, ALWAYS, a good time to start a new, healthful, life-affirming, world-changing, planet-loving, animal-friendly habit. What food habit would you find the hardest to break? Why? I’d love you to share this in the comments.